In case you were concerned about the lack of web updates in the last 24 hours, I sincerely appologize. I was a little preoccupied yesterday…. I was quietly sitting at my desk after lunch yesterday when Tucker, a member of the fulfillment team came up and said, “a tree limb fell on your car”. After my initial reaction of, “really?”, I ran downstairs and down Severn Ave to find this. 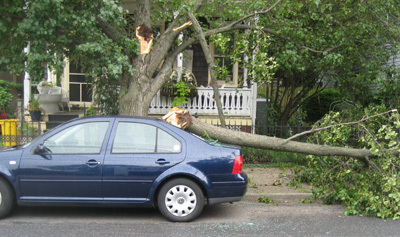 (see picture at left) Seems the serious storm on Sunday knocked a limb loose and I decided to pick the wrong parking spot for the day. I guess I’ll think twice about parking under trees from now on. Half off APS had beaten me to the scene and were checking out the damage and luckily for me a few had already gotten a tarp because of course, it began pouring a few minutes later. So, with some help from some of the boys, we (I drove the car forward while the boys grabbed the tree) were able to get it off the car and covered with a tarp without too much water going in. 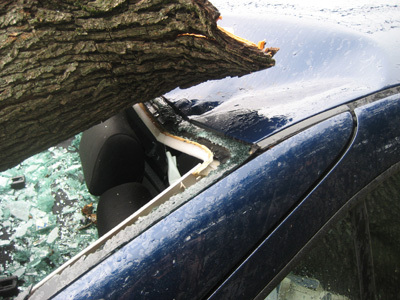 After visits from the Annapolis Police, calls to the town about their faulty tree and many, too many, to the insurance agency it looks like with any luck I will have blue back in a few weeks. Or, maybe take up everyone’s advice and turn it into a Jetta convertible? Hmm, you know, it could be quite nice around Annapolis in the summer and the roof already needs to be replaced so I guess I’m already mostly there? The winter might be a little cold though. Pass. 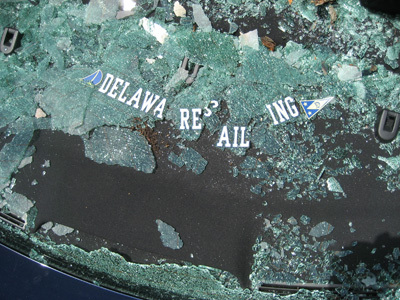 In any case, the only pieces of safety glass left holding together from my windshield was done so by my trusty Delaware Sailing sticker. I’m glad to see the power of the Del team kept their act together. I guess a trip to Newark is going to be in order for a new one. Luckily, no one was hurt or around when it happened so at the end of the day the only loser in this battle is my Jetta and my wallet. 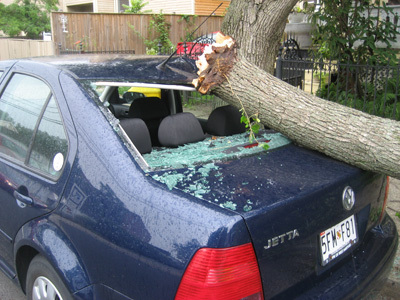 Glad I could test of the battle of Jetta vs Tree for everyone. Results are conclusive… Tree definitely wins.